Clicksor is an online affiliate program that does contextual marketing on the web. It scans for the keywords in your website and places the advertisements related to those keywords. It is more or less similar to Google Adsense and it is one of the best alternatives for that. This site was founded in 2004, five years after they had their sister company Yes Up which is an ecommerce site. They were originally located in New York, but they have moved to Ontario, Canada. On the basis of Geo-targeting, keyword targeting and channel targeting this site does a good job in matching the potential buyers with the content of your website. This means, when anyone visits the advertisements displayed in your site and enter through the sale’s process, you are credited with 10% of the profit if that particular sale is done successfully. Another important thing to be noticed is, Clicksor.com is not suitable for newbie. It will really make you extra amount of money only when your website has traffic. If your website is popular with huge traffic, then you can sign up with the Clicksor.com. You are paid for the graphical or text ad when they are clicked. you are paid at each time when the user views the page. This is a best choice of making money because the impression is counted whether or not the visitor clicks the ad. For every thousandth impression, (1000th time the ad displayed on the site) you will be paid. You are paid when the user clicks on the full page id in interstitial format. Clicksor text ads CPC, PPC rates are $ 0.035 per click. And one more useful information is that you can make use of Clicksor and Google Adsense together on the same page. For that, just ensure that the clicksor ads don’t look like Google Adsense ads and their contents must not violate the Google Adsense program policies. Thus, Clicksor has high reputation among the website owners and bloggers to earn a handsome amount of money regularly. You can get payments every 15 days with $ 50 as minimum cashout. 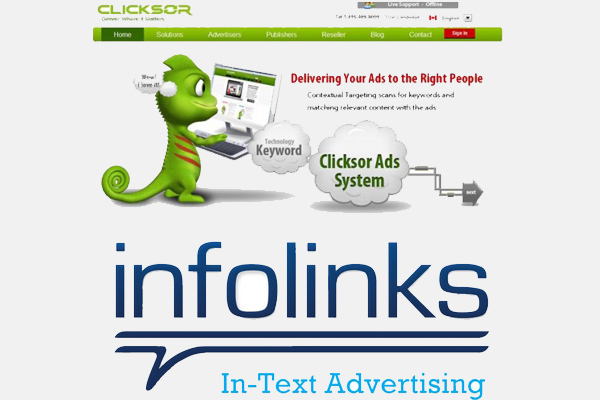 Infolinks is a text advertising network which acts similar to the Google Adsense and Clicksor.com. This is a best site for the bloggers who have not been approved by Google Adsense and seek for some best affiliate program to display the ads on their sites. Initially, create an account with Infolinks.com or can also use Facebook credentials to create the account. Once you have created the account, you are taken to the publisher’s center where you can check the up-to-date information about your status, ads since the last payout. Within 48 hours after creating the account, it will be approved by the administrator after which you can generate the ad code and copy paste it to your site. As soon as you do this, the ads will start getting displayed in your website. This site also provides additional tools to attract more people and visitors to the site. Make use of all those tools, additional tags it provides and tag clouds and search widget on your website. Just like Clicksor.com, the minimum payout for this site is also $50 which can be drawn through paypal. Thus, on the whole, you must need a worthy website or blog with fresh noticeable content which may attract more and more people to your site. If your site has started to get reputation, it will reach many people all over the world thus resulting in more number of visitors to your site. Even, if you have 100 visitors per day you will be able to make a minimum of $ 10.00 within a short time. This can be achieved only when your site is up-to the mark and worthy. Don’t Forget to share this post and Join my newsletter to get updates in your inbox. Clicksor and Infolinks are two good advertising programs, we can make extra bucks by using these two. I am using infolinks on one of my blog and getting good income from infolink. Glad you like this post. Am also using infolinks for my free blogs. Earning is really awesome when compared to adsense or other contextual networks. Thanks for sharing your view here. Keep on reading my blog kuldeep. No doubt that the inflolinks andclicksor are the two best ways to earn extra money from blogging. But, can you tell me please what is the criteria before applying these two ad networks on a blog at first time. One most important things that I would suggest you to enable the right click button your website, so that me and many other bloggers can help you to share your new blog posts on various social media sites. Thanks for stopping by. The basic criteria for every contextual ads, the blog should be alive for more than 6 months. By doing this anyone can use this ad programs to earn money from online. Clicksor is the best alternative for adsense. Mostly, all bloggers are trying to use google adsense for their blog. According to me, we can try other alternatives before the acceptance of google. I agree with you vikas, here i disabled right click option because of, not copying my content by others. Here i included share buttons to spread my post. Better you can use this. Glad you like my post. Thanks for your interest in my sharing my post. Keep on reading my blog. Wish you a happy weekend too. Hope you will respond to my latest post. Infolinks is one of the best alternative of google adsense. Nowadays, more bloggers are using infolinks and earning more money. I think, you didn’t adjust the account settings and integrate option in infolinks. Better you once again, log in and adjust the settings in integrate. We can add, how many ads we want to out site. Anyway thanks for your coming and sorry for the very late reply.